I heard last week that there's to be a Japanese edition of this book. I'm looking forward to seeing what they do with it, and curious to know if they'll make the setting Japanese. 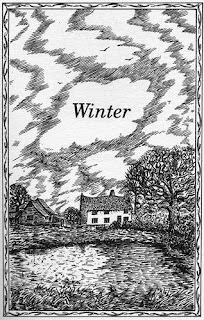 For the UK edition Sian Bailey made very beautiful black and white drawings of plants and of some places very close to where I live. The Winter picture shows a farmhouse in a place called Bulls Green. I see that OUP are producing a new reading scheme targeting boys. It's called Project X. Getting boys to read is the Holy Grail of children's publishing - or one of them, if you can have more than one. Just imagine all those boys rushing to bookshops to spend their pocket money on books. My first book was about football. Publishers believed that football stories would engage boys, but one perceptive reviewer pointed out that boys who played football were too busy playing to read about it, and boys who didn't play weren't interested. There are plenty of exceptions to this, but there's also a good deal of truth in it, and I guess that's why I didn't achieve overnight fame! So, what's my solution to the problem of boys' reading? First of all, don't even start to teach children, especially boys, to read until they're at least 7 years old. In the meantime, tell them loads of stories and read to them. But there's no point going on, is there? Because our entire state education system assumes we start teaching children to read when they're 4.